Spurs strike late as Higuain scores twice for Chelsea - SABC News - Breaking news, special reports, world, business, sport coverage of all South African current events. Africa's news leader. Son Heung-min 83rd-minute goal earned Mauricio Pochettino's men a hard-fought 1-0 win over Newcastle. Son Heung-min struck late to fire Tottenham into second place in the Premier League on Saturday as Gonzalo Higuain opened his account for Chelsea in a five-goal rout at Stamford Bridge. Spurs looked to be heading for their first league draw of the season at Wembley, but Son’s 83rd-minute goal earned Mauricio Pochettino’s men a hard-fought 1-0 win over Newcastle and enabled them to leapfrog Manchester City, who play on Sunday. Chelsea beat bottom side Huddersfield 5-0 thanks to two goals apiece from Higuain and Eden Hazard and a late header from David Luiz as they returned emphatically to goal-scoring form. Tottenham are now just four points behind leaders Liverpool, who are in action at West Ham on Monday, but just as significantly they consolidated their position in the top four after their 19th win in 25 matches. Spurs enjoyed more than 70% possession, but faced a dogged Newcastle, buoyed by a stunning 2-1 win over Manchester City in midweek that carried the Magpies five points clear of the relegation zone. An incredible clearance off the line from Fabian Schaer denied what seemed a certain goal for Christian Eriksen and Fernando Llorente then looped a golden headed chance high and wide. 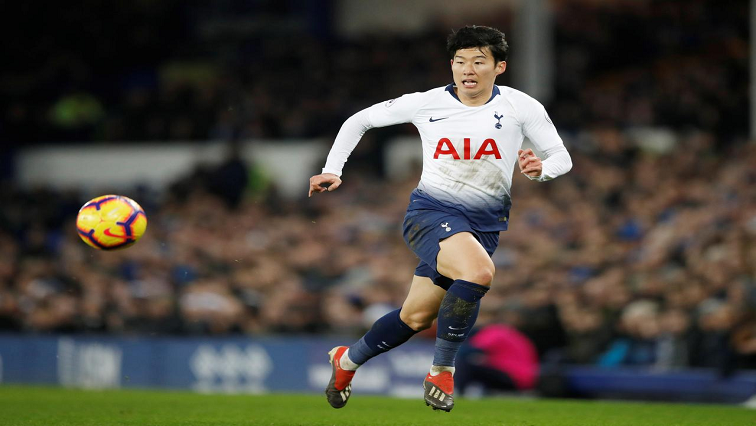 But Son again stepped up, just as he did with an equaliser against Watford in midweek, to compensate for the injured Harry Kane’s absence with his 14th goal of the season. The South Korean had a helping hand from Newcastle goalkeeper Martin Dubravka, who let the powerful shot slip beneath his grasp to undo all his side’s good work. “It is a massive result to be in a very good position in the table. We don’t need to be in some position like today to convince ourselves about our capacity or potential. We believe in ourselves,” said Pochettino. The Argentine lauded Son’s stamina since he returned from the Asian Cup. “Sonny is like a battery that you have that you work, work, work, work but when the battery is gone, it’s gone,” he said. Chelsea manager Maurizio Sarri admitted before the match against bottom side Huddersfield that he had found it hard to get any rest since Wednesday’s humiliating 4-0 drubbing at Bournemouth. His side, seeking to avoid a third straight Premier League defeat, went ahead in the 16th minute through Higuain and doubled their lead with a Hazard penalty on the stroke of half-time. Both players scored again midway through the second half and Luiz made it 5-0 as Chelsea returned to the top four at the expense of Arsenal. Higuain, 31, was signed on loan until the end of the season from Juventus to help the 2016/17 English champions rediscover their sharpness in front of goal. “When Higuain arrived he wasn’t at the top of his physical condition. Now he is improving. Apart from the goals, my feeling is he is really very suitable to play close to Hazard. For us it is very useful. For Higuain, he will be able to score a lot of goals, but also it will be good for Eden,” said Sarri. Wolves consolidated their hold on seventh by beating Everton 3-1 at Goodison Park, in a match interrupted when a black cat began scampering around the pitch. “Where I come from in Portugal the black cat is bad luck so I never want to see cats again,” said Wolves boss Nuno Espirito Santo. The Everton manager, Marco Silva, is also Portuguese. Wolves have now scored 10 goals in their past three Premier League outings. Elsewhere, struggling Fulham were unable to recapture the spirit of their dramatic midweek comeback against Brighton, losing 2-0 to Crystal Palace. Southampton conceded a penalty deep into added time to draw 1-1 at Burnley while the game between Brighton and Watford finished goalless. Cardiff was playing at home for the first time since the disappearance of a plane carrying new signing Emiliano Sala from France. The home players warmed up in T-shirts with Sala’s image on them and the stadium stood silent to remember Sala and pilot Dave Ibbotson. This entry was posted on 02 Feb 2019,08:55PM at 8:55 PM and is filed under Sport, Homepage Featured Story Slider. You can follow any responses to this entry through the RSS 2.0 feed. Both comments and pings are currently closed.